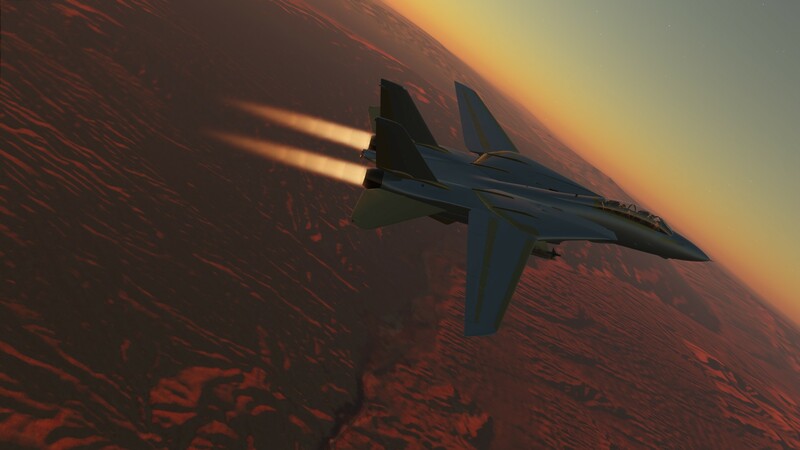 Since early June I have had the privilege to test the upcoming DCS: F-14A/B module from Heatblur simulations. I have been a fan of the F-14 Tomcat since I was a kid. I caught the bug attending Dayton Air Shows in the 1980s with my family and I have spent the last several decades devouring books, magazine articles, online discussions and online content that discuss what it was like to fly this storied US Navy fighter. The F-14 Tomcat is a fighter that, although it needs no introduction, often seems to need some explanation. 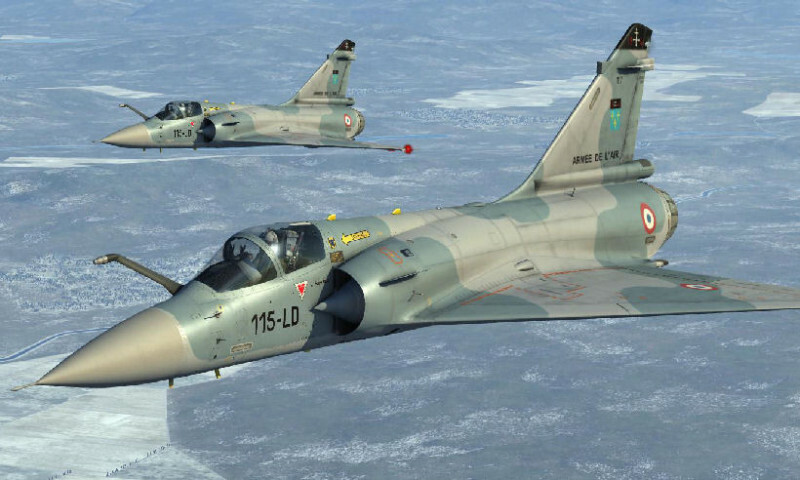 Though perhaps the most recognized of 4th generation combat aircraft, she has also become a rather polarizing figure in the aviation world with innumerable supporters and her share of detractors. This enthusiasm, both pro and con, has led to a vaunted reputation as well as countless myths concerning the aircraft’s character, origins and true capabilities. As with most sea stories, the truth lies somewhere in between and I have enjoyed parsing myth from reality. A few minutes with the Heatblur F-14B module has answered more questions than almost 30 years of reading! For context, I am a life-long aviation enthusiast who did not have the privilege to fly the F-14. I first started with flight simulations in the early 90s with “Chuck Yeager’s Air Combat” and continued until the late-90s with Jane’s F-15. 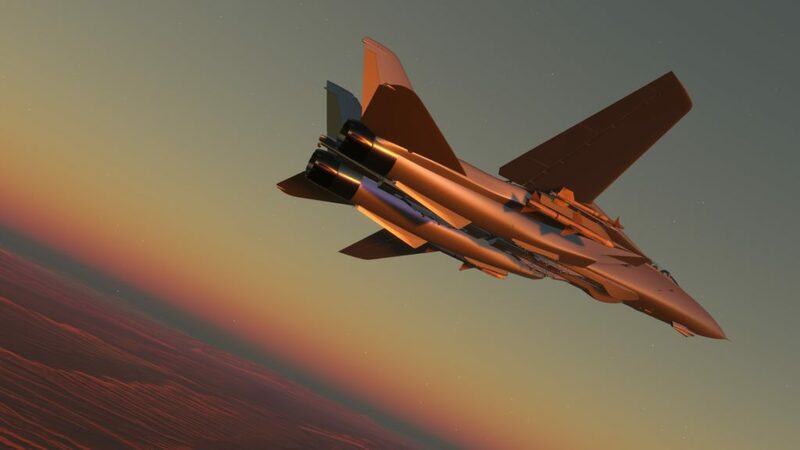 I took a protracted break to pursue my education and career but my interest was abruptly re-awakened by the release of the Aerosoft F-14A/B. It was the first Tomcat simulation that seemed to offer reasonably realistic flight dynamics and was brave enough to model TF30 compressor stalls. I was so intrigued that I bought a new desktop computer (for the first time in ~6 years), a TM Warthog, rudder pedals and P3Dv2 to support the Aerosoft F-14. While exploring other sim options I stumbled into DCS, facilitated greatly by the announcement of the DCS: F-14A/B. The level of detail, flight models and system modeling along with the opportunity to simulate combat sold me immediately. 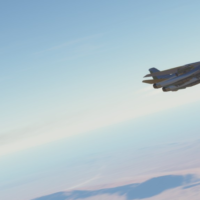 I bought the MiG-21 and F-15C and was blown away by the experience. I now own nearly every module and play DCS exclusively. 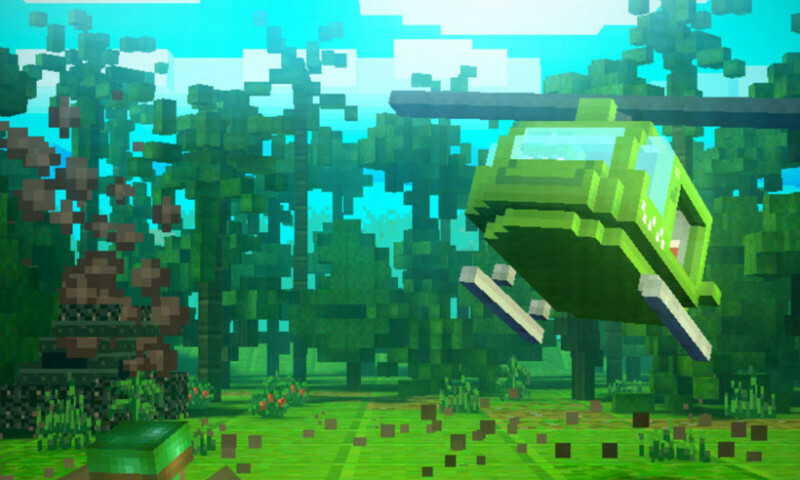 When I left flight sims in the late-90s I thought that the genre was dying and figured it was time to move on. With the growth of DCS and 3rd party modules, along with the addition of big-time breakthroughs like VR, I never imagined that flight sims would grow into what we have today. The Heatblur F-14A/B represents a colossal project for the team at Heatblur simulations. The F-14’s fame ensures legions of fans who, like me, will only settle for the most accurate portrayal of the aircraft that they hold so dear. Fortunately the Heatblur team understands their responsibility and has set out to meet those expectations. This means collecting a tremendous volume of information on the aircraft (much of which is quite hard to come by), developing new techniques and technologies, creating incredibly detailed artwork based on technology like laser scanning and photogrammetry, and tirelessly tuning and adjusting the flight model until it truly matches their extensive references. Fortunately there is a lot of excellent information of the in-flight behavior of the F-14 courtesy of NASA testing, data from the NASA flight simulators and USN performance charts. 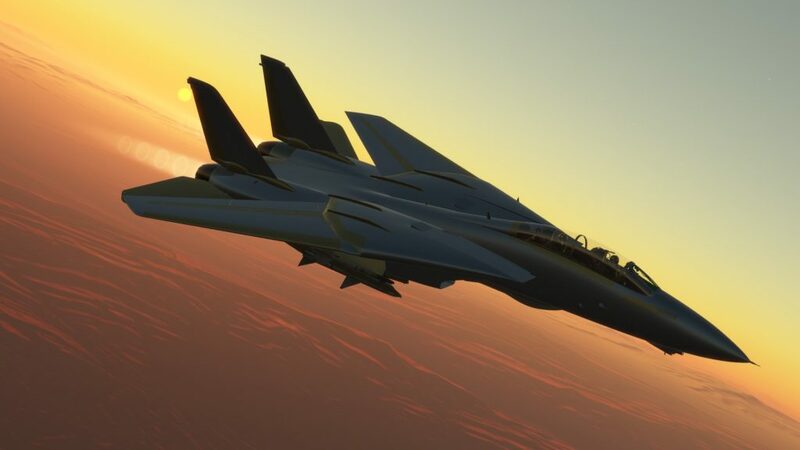 This includes information on the edges of the performance envelope and also control-response information that allows the FM to really capture the character of the F-14 during normal operations. 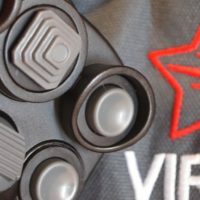 This has allowed the F-14 flight model developer (Daniel/Swither) to meticulously recreate the experience of flying the F-14, not just in terms of acceleration and roll rates, but what it is like to dampen dutch roll and gently thumb the DLC (Direct Lift Control) to stay in the groove during carrier traps or dance with the basket during aerial refueling attempts. So what is she like to fly? 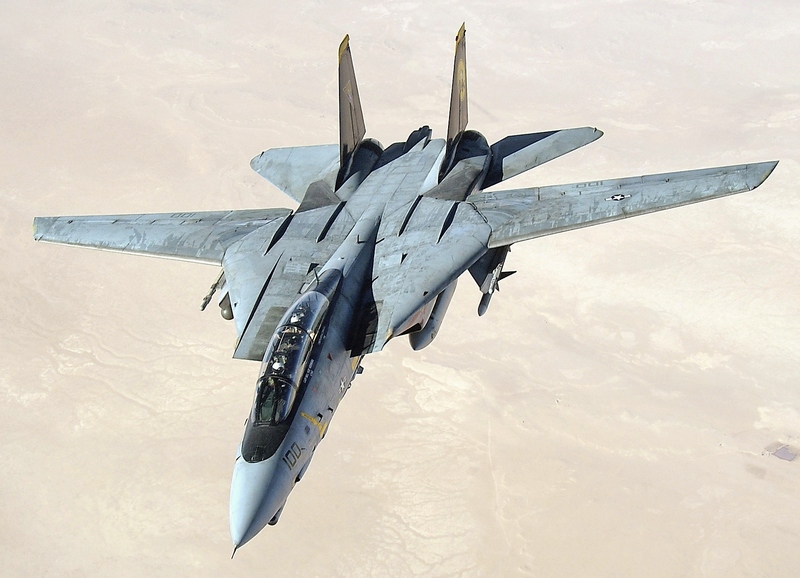 The F-14 was developed during an interesting transition in aircraft design. Built to address combat proven weaknesses in the F-4 Phantom and other 3rd Generation US fighters, the Tomcat was built to do it all. While the BVR capability of the Tomcat is very well-known, the aircraft was built first as a “4×4” dogfighter (4 heat seakers + 4 radar guided missles) and they later found a way to cram the AWG-9 and AIM-54 system into the airframe. This “4×4” dogfighter was designed with huge control surfaces, a bubble canopy, and variable geometry wings – the variable geometry wings being the only way to marry the top speed requirements to the required USN approach speeds. The airframe, however, was also less stable than earlier US fighters. While this aided agility, the Tomcat could be an absolute handful under some conditions, especially since she lacked the advanced flight control systems of later 4th gen fighters. The F-14A and F-14B of the 70s to mid-90s had a relatively simple analog stability augmentation system. It certainly helps to improve aircraft handling but lacks the sophistication of the F-15Cs control augmentation system or much more capable fly-by-wire systems. This means the pilot gets to enjoy plenty of tasks that later fighters would not require, like frequent trimming and rudder coordinating aileron rolls. First impressions of the flight model in the DCS: F-14B are similar to those of other reasonably modern fighters in DCS. She is an honest airplane with responsive controls, excellent nose point-ability and a reasonably good roll rate. Basic maneuvers,however, reveal a bit more personality than most other aircraft. There is a fair bit of either proverse or adverse yaw during rolls and banks. One can clearly see the nose moving into a slightly different position than the direction of flight with big roll inputs. The nose position varies with speed and aircraft configuration (ie: wing sweep) and it feels very dynamic and organic. Directing the aircraft to your direction of choice is straightforward but the airframe seems to move around a bit more than usual during banks and rolls. This can become an issue with rapid and sustained roll where the nose can build up a big deviation from the direction of flight. At higher speeds, rapid roll coupled with pitch inputs can rapidly lead to a departure (and the loss of a bunch of airspeed and altitude!). Also, as the wings sweep there is a noticeable decrease in roll and yaw stability. This keeps the pilot busier and requires greater care during maneuvers. Sweeping the wings also results in more pitch authority; not necessarily better turning performance, but the AOA can build up quickly with pitch inputs. Care must be taken to avoid departures during that aggressive case 1 break into the pattern (Sierra Hotel!). In general, wing sweep has a pretty large impact on aircraft behavior. The dihedral effect of the wings at 20 deg is very helpful for keeping the airframe stable and its absence is noticeable once the wings start sweeping. Trying out the different sweep modes (auto, bomb, and manual) is quite fun and exposes the depth and completeness of the Tomcat FM as routine maneuvers can feel quite different with changes in wing position. Another notable feature of the F-14 is the airframe inertia. Though big control surfaces help to offset the Tomcat’s mass, even a quick flight confirms that the Tomcat weighs four times as much as the F-5E! While the Tomcat can handily out-turn the F-5E, there is a purposeful heft to maneuvers that feels different from the MiGs, F-5E or Mirage. Pitch maneuver require large stick inputs to really get the nose moving. Once the nose starts pitching, I often need to release a bit of back pressure on the stick or AOA will build up, bleeding airspeed and hampering turn performance. Precision maneuvers (like tanking) require patience as the nose is a bit slower to respond to small precise movements than the F-15C. I need to give the jet a moment to respond before adding or countering inputs. New pilots can expect to experience a fair bit of operator induced oscillations (OIOs) while they learn the Tomcat’s ways. If you are a Tomcat fan, you probably know that pitch rate was the aircraft’s greatest ACM strength while roll was its weakness. Heatblur’s FM carefully matches this characteristic well. Pitch rate from ~275 KIAS to 450 KIAS is impressive but maintaining optimal AOA is essential for performance. The Tomcat’s best performance is found between 15-20 units of AOA. Even around 15-17 units there is a tendency for a little wing drop and a touch of yaw during break turns. This does not necessarily interfere with maneuvers but it needs to be countered to maintain an accurate pursuit. Breaks into the vertical are more stable with even high AOA transients (AOA meter pegged) resulting in little-to-no instability. Even with some airframe movement (little yaw or roll) the nose remains point-able up to a high AOA, but the drag limits usefulness. Expect to bleed a lot of airspeed in seconds with high AOA and have little to show for it. Once airspeed falls below 250 KIAS, the AOA builds rapidly with pitch inputs so generating a solid pitch rate can be challenging. Dropping the main flaps (Tomcat crews called this “putting down the big boys”) helps a fair bit below 225 KIAS. The best performance is around 300 KIAS and 15-17 units AOA. As for the roll performance, while the roll rate is not slow it is not fast either and certainly cannot match the speed or precision of roll in the F-5E or F-15C. There is also a moderate amount of roll inertia. Stopping a max performance roll requires a fair bit of counter stick. Furthermore, due to the yaw moments during roll, handling is aided by a brief pause between roll and initiating pitch. This amounts to a modest tactical limitation and sustained horizontal scissors with a F-5E is not a great idea. “The Hornet is a forgiving jet, which patiently awaits your apprenticeship. When you are ready for it, she will take you to the next level, and then the level after that. You never get the sense that you have fully explored all her capabilities. A mere mortal of exceptional talent may explore her depths in one mission area, but nymph-like, she will dance away from him in other specialties. Always she beckons, always awaits, never grows impatient. She’s like the good wife, who will bring you home safely, even when you’re forked up. The same cannot be said for the F-14A Tomcat. 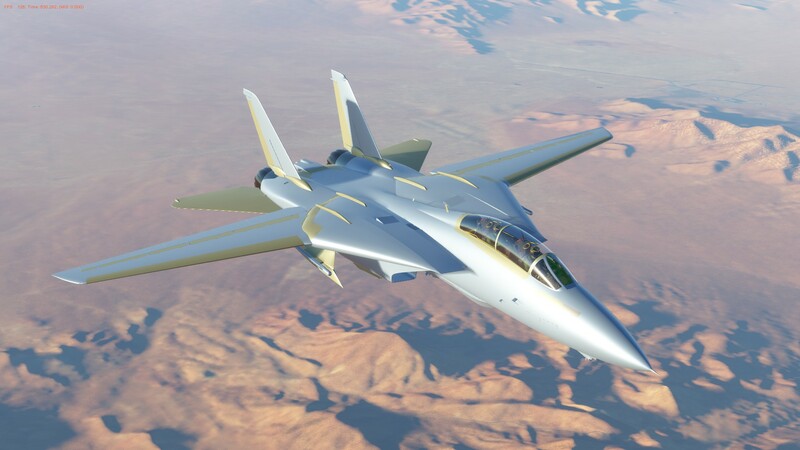 The Tomcat is an impressive looking airplane – hulking with potential, brooding with malice. If the engines in the A-model had been explicitly suited to frighten aviators into premature old age, they could not have been more carefully and lovingly designed for the purpose. Cross-grained and stubborn as a mule, the Tomcat demands that you fly her way. And when you’ve reached a certain level, she holds you back jealously, unwilling to see you advance beyond her capabilities. She’d kill you in a heartbeat, given half a chance, and spit on your grave. And to land? At night, aboard the carrier? Sheer madness. There is little doubt that “Neptunus Lex” harbored some biases towards his airplane, but it is also clear that the Tomcat was a very different jet to land than the Hornet. Though compared to its predecessors (the F-4 Phantom and the F-8 Crusader) the Tomcat is blessed with several features that make it much easier to handle around the boat than those earlier jets – namely a nice, slow approach speed and excellent fuel economy at low altitude. There is a ton of lift but easy handling is not a feature. As speed decreases, the control surfaces lose their authority and larger control inputs are needed to change the aircraft’s attitude. Full flaps further decrease the pitch authority and making precise attitude changes on the approach is a bit difficult. During landing approaches, pilots quickly learn to appreciate a unique Tomcat feature: the DLC. Once activated by a switch on the control stick, the Direct Lift Control raises the center leaves of the Tomcat’s wing spoilers to modulate lift during the approach. The wing spoilers deploy about half way and can be further raised or retracted by a rolling thumb switch on the stick (roll forward to deploy and roll back to retract). DLC allows the pilot to make small changes to the glideslope without attitude changes. Given the sluggish and imprecise response of the nose to pitch inputs this feature is very useful, especially around the boat. Adding to the difficulties with pitch, the Tomcat exhibits a lot of dutch roll at 15 units of AOA. Just as described by “Neptunus Lex”, a right-wing dip for lineup will first cause the nose to drift left, followed by a slow right drift a moment later. That drift often continues for a short time, even once the wings are leveled. Lateral stability is lacking so back and forth roll commands lead to wallowing and nose swings, a totally unsightly behavior – it is awesome! If you recall “Cougar’s” infamous evening approach onto USS Enterprise in Top Gun, then you know what I mean. The Tomcat is easily the hardest jet to land in DCS (and it should be!). Luckily, the very robust landing gear allows you to drop onto the deck rather hard without much risk of damage – unlike the MiG-21. Great article! I am really looking forward to flying the F14 (as well as the F/A-18 and Harrier). What an amazing time to be involved with the flight simulation hobby. A really enjoyable read. I think I’m going to be crashing into all sorts of Carrier bits by the sound of it. 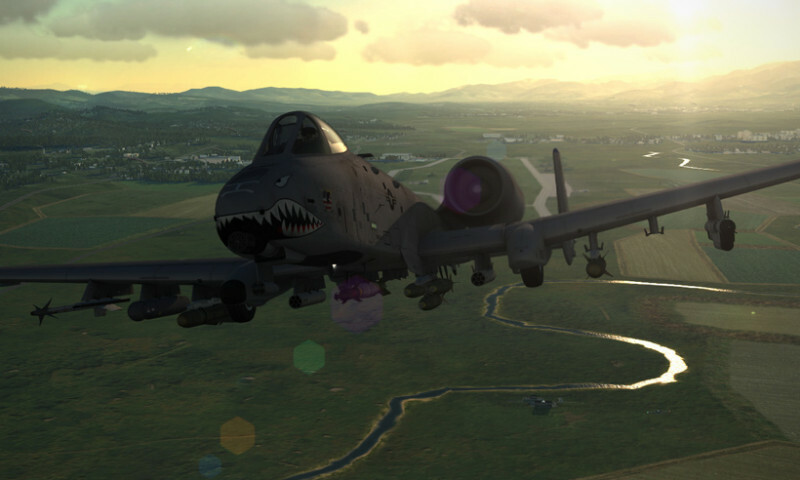 Thanks again to all at Heatblur for the exclusive images, @nicholas.dackard and @Fridge for organizing it all and, of course, Nicholas Pirnia for authoring such a great article. @fearlessfrog is there a way we can autocorrect for that? It seems to be happening a lot lately. In the same “boat” as I look to upgrade my gaming laptop after 6 years just to fly the Tomcat in DCS. Long time fan of the jet pre 1986 movie, and one of the reasons I joined the USN for that rare chance. Having a good time with the Aerosoft model in FSX/P3D until then.